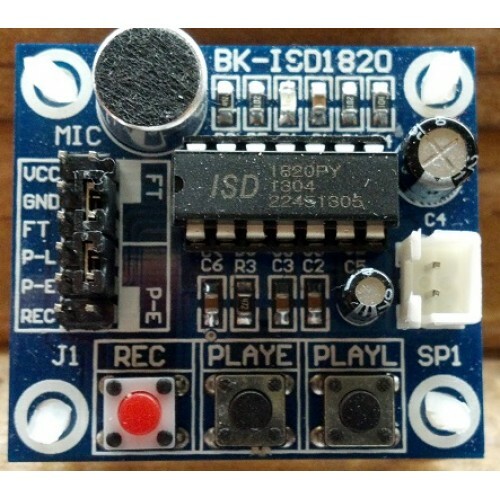 ID your repeater, build your own voice keyer or just annoy your family and friends. This is the voice recorder board used with the ID-O-Matic IV repeater controller. This board will record and play back a 10-second voice messsage. Simple to use; hold down the REC button to record the message, and press the PLAY button to play the message back. 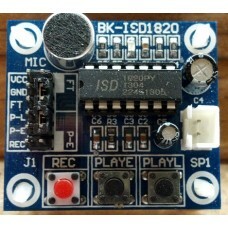 The on-board audio amplifier is enough to drive a small 8 Ohm speaker, and there is a microphone on board as well. These boards have no header pins or speaker connectors, since they are not needed with the ID-O-Matic. Solder pads are provided for off-board connections. This product is fully assembled. No connectors are installed, making it easy to connect to your ID-O-Matic III or IV or your own project via wires.